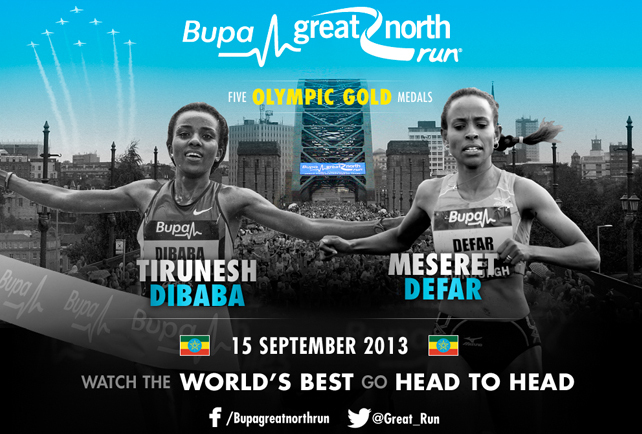 Ethiopian's Meseret Defar and Tirunesh Dibaba, winners of the recent World Championships 5000m and 10000m gold medals, will compete at next month's Bupa Great North Run after their track successes. The pair of superstars have been intense and sometimes bitter rivals in international careers extending a decade. They will clash in Britain’s biggest running event from Newcastle to South Shields on September 15. Their presence in the race, which has attracted 56,000 runners of all abilities, promises to match the quality of the men's contest featuring the ‘Dream Team’ of fellow Olympic and World champions Mo Farah, Kenenisa Bekele and Haile Gebrselassie. Defar and Dibaba are both at the experimental stages in their half marathon careers. However, they already have very high profile successes under their belts despite their inexperience over the 13.1 miles distance. 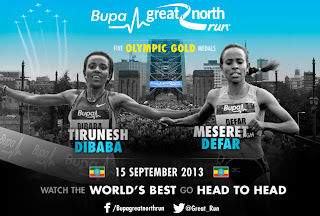 Last year's Bupa Great North Run saw Dibaba, on her debut, win a thriller ahead of Kenya's Edna Kiplagat in a very fast time of 67 minutes 35 seconds. In February Defar ran 10sec quicker in the Rock 'n' Roll New Orleans half marathon. "That's impressive running and clockings by anyone's standards," said Peter Riley, the Bupa Great Run series elite athletes’ manager. "I'm sure given their great rivalry, we could see them go even faster in a few weeks’ time. "I'm looking forward to their latest head-to-head and it should be an intriguing battle down the course from the world's two best distance performers in recent years." Riley added: "They were prevented from clashing against one another when the Ethiopian Federation would not allow them to double over 5000m and 10000m in Moscow. So the World Championships loss is definitely our gain." Dibaba, nicknamed the ‘Baby Faced Destroyer’ and at 17 years 333 days the youngest ever winner of a world individual title at the 2003 Paris Championships, has often been in conflict with her fellow countrywoman which came to a bitter head seven years ago. After five meetings she was one of four unbeaten athletes in contention to share the Golden League purse of US$500,000 at the final in Berlin. However she lost out on that big pay day when beaten by an inspirational 5000m display from Defar. "Things between them I understand are much better these days, both really are outstanding ambassadors on and off the track for their country" said Riley. "They've actually shared for many years the same American manager, Mark Wetmore." Competitiveness between them however remains extremely intense. Dibaba, having won the London Olympic Games 10000m crown was denied the 5000m crown a week later by Defar and who, in their 32 head-to-head clashes to date, leads by a score of 19-13.